Anthony Dyson trained as an artist at Blackburn School of Art and graduated as a teacher at Leeds College of Art. He subsequently gained a Doctorate in History of Art at the Courtauld Institute, University of London. His prints are in private and public collections in Britain and abroad, including: the British Museum, London; the Science Museum, London: the Guildhall Library, London; University of London Institute of Education; Birkbeck College; the Ashmolean Museum, Oxford; Sagene Laererskole, Oslo; the Leonardo Sciascia Print Foundation, Italy; and the Harvard Theatre Collection, U.S.A. Recent exhibitions of his prints and drawings include one-man shows in Le Lion d'Angers, France (2006, 2007) and group shows at: the Royal West of England Academy; the London Original Print Fair; the Royal Academy Summer Exhibition; Bushy House, National Physical Laboratory (Teddington); the Art and Architecture Shop, Richmond; the RE Annual Exhibition, Bankside Gallery, at which in 2010 he gained a Fenton Arts Trust award; and later in the same year he was awarded a prize for his etching "Borough Market", shown at a national exhibition on the theme of London. He has taught Art and History of Art in schools and colleges of education, ultimately as a Senior Lecturer in the University of London Institute of Education. In this connection his writing has been published widely in the International Journal of Art and Design Education and in such books as Teaching the Humanities (ed. Gordon), Woburn, 1991. 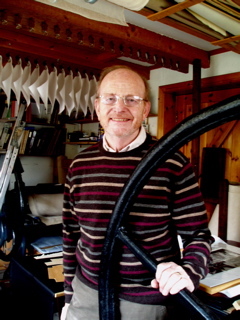 His writing on printmaking has been published extensively in: Print Quarterly; Printmaking Today; and the Journal of the Printing Historical Society. His major study, Pictures to Print, Farrand Press, 1984, is in the libraries of universities and museums in Britain and abroad. His monograph Passion & Paradox, on the artist Stanislaw Frenkiel, was published by him at the Black Star Press in 2001 and his most recent full-length work is the editing of Printmakers' Secrets, A&C Black, 2009. In 1987 he left full-time teaching to establish his Black Star Press. Here, as well as making his own prints, he worked for fifteen years as a master printer, producing editions of the work of other artists (including portfolios of the prints of Robin Tanner, Edgar Holloway, Paul Drury, Harry Eccleston and Stanislaw Frenkiel) and printing historic engraved plates for establishments such as the Tate Gallery and Harvard University, the print publishers Frost & Reed (Bristol) and Rosenstiel's (Chelsea). From 1990 to 2000 he published the Calendarium Londinense for which he designed, made and printed the illustrative etchings. In reaction to the need for topographical accuracy in such series as the London Calendar plates, his recent aspiration is for a greater fluency of style. In an attempt to achieve this he frequently works directly onto his prepared etching surface in the open, dispensing with preliminary sketches and only using the studio for the biting and printing of plates. Alongside this, the sketchbook remains an important means of generating ideas.